October 2nd is Mahatma Gandhi’s birthday. Gandhi fought for our independence that we enjoy to this very day. The father of our Nation who drove the English with a stick in his hand (locally referred as Dandi). Not many know about the role his wife Kasturbai played during our independence struggle. •	Kasturbai was a year older than her groom, Gandhiji. •	Gandhi taught his wife to read and write. •	Kasturbai sold her jewels to pay for Gandhi’s studies. •	Kasturbai was inspired by her husband thus she activity took part in the freedom struggle. 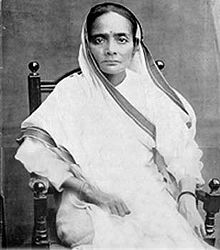 Kasturbai devoted most of her time to household chores, and taking care of her sons as Gandhi was a busy man. However she was more courageous and fearless than her husband. With time she was gradually attracted towards public service. Her first agitation was in South Africa, she protested against the ill treatment given to Indian immigrants. When the couple returned to India in the early 1910’s she would go on to inspire other women folk to take part in the freedom fight. She sat on plenty of fasts. She spent lots of time educating women on reading, writing, health and hygiene. Her life had been overshadowed by her husband’s work. She did take her husband’s place in many occasions while he was jailed. But she never shared the same platform as him in any of the events. She had plenty of health issues .She suffered two heart attacks. Gandhi had objected for her to consume penicillin. He insisted on her taking ayurvedic treatment instead which was of not much help to her. She took her last breath by her husband. It’s nearly tough to find knowledgeable people like Gandhi.